Looking for an inexpensive .410 practice round or an alternative for more expensive ammunition for your next upland bird hunt? 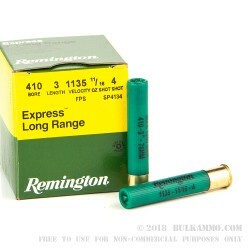 Remington’s Express Long-Range shotshells are a great choice for the range as they offer consistent flight patterns at an economical price point and serve a dual role as a solid upland hunt performer. 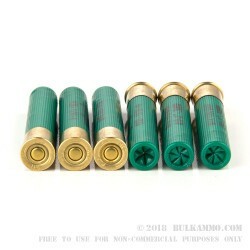 These 3” .410 rounds are loaded with 11/16 oz. 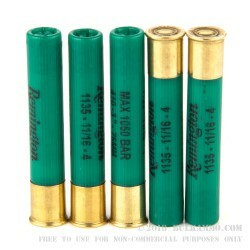 of #4 lead shot and are capable of a muzzle velocity of 1135 FPS. 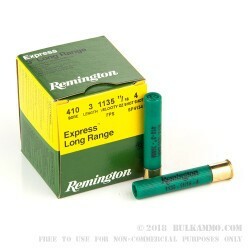 Each box of Remington Express Long-Range comes with 25 rounds of .410 ammunition. A trusted choice for generations, Remington is known for producing legendary firearms and ammunition. With a reputation for creating consistent, quality products, Remington with their facility at “The Rock” continues to be a world leader in firearms technology.